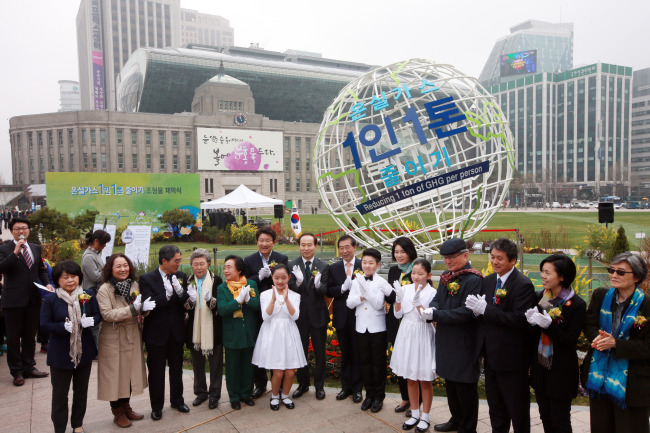 Seoul City is hosting the five-day International Council for Local Environmental Initiatives World Congress 2015 at Dongdaemun Design Plaza, eastern Seoul, in an aim to urge better cooperation for a sustainable future. It is the first time a Korean city has held the ICLEI’s flagship assembly. ICLEI, the world’s largest municipality network comprised of over 1,000 cities from 87 countries, seeks collective efforts to lead a sustainable future and curb global climate change. Launched in 1990, the organization has focused on cutting carbon emissions. Over 50 Korean cities have joined the international body, including Seoul, Incheon, Busan and Jeju City. A total of 203 city representatives, including Paris, Tokyo and Guangzhou, and over 250 officials from international bodies will participate in the assembly. It is the most participants in the ICLEI’s history, the city said. Guests include high-ranking officials such as Joan Clos, executive director of the United Nations Human Settlements Program and Yvo De Boer, director general of the Global Green Growth Institute. Under the theme “Sustainable Solutions for an Urban Future,” the ninth event will provide opportunities to share each city’s green initiatives and seek ways to boost the municipality’s role in solving global issues. The triennial assembly mainly consists of seven plenary sessions, eight sub-plenary sessions and 28 small roundtable talks. The plenary sessions will discuss global climate change issues and examine solutions for sustainable regional development. The sub-plenary sessions cover various issues, from strategies for local water security to post-2015 agendas, the city said. The small roundtable talks will devise plans on how to practically motivate municipalities to fulfill their roles in eight agendas. These include sustainable city; resilient city; biodiverse city; low-carbon city; resource-efficient city; smart urban infrastructure; green urban economy; and healthy and happy community. At the opening ceremony Wednesday, several key officials will deliver high-level addresses. Three speakers will include Ibrahim Thiaw, deputy executive director of the U.N. Development Program; Michele Sabban, president of R20 Regions of Climate Action; and Xinsheng Zhang, president of the International Union for Conservation of Nature. After the speech, city participants will adopt the ICLEI Seoul Declaration, which will underline the municipalities’ efforts toward reaching the goals addressed in the Compact of Mayors. The compact, which was settled in the U.N. Climate Summit in September last year, addresses cities’ pledges to scale up their commitments to cut greenhouse gas emissions by 454 megatons by 2020. The declaration will also urge countries to agree on new post-2020 targets and take stronger action to reduce carbon emissions. The joint efforts of municipal governments against climate change have been considered crucial as curb countries around the world are preparing to step up their anti-carbon measures to meet their new post-2020 targets. More than 30 countries, including the U.S., Mexico and the Europe Union members, submitted their detailed pledges to the U.N. Framework Convention on Climate Change in the form of Intended Nationally Determined Contributions last month ahead of the Paris talks later this year. In December, countries will finalize their post-2020 targets for cutting the carbon emission at the U.N. Climate Change Conference, or the Conference of the Parties 21 in Paris. The talks are intended to limit warming to 2 degrees Celsius ― which experts consider as the threshold for dangerous climate change. This will mark the first time that developing countries will join the new agreement. The Kyoto Protocol in 1997 only required developed states to curb emissions. In the World Mayors Council on Climate Change on Friday, municipalities will negotiate on how to expand participation in the Compact of Mayors and enhance accountability. As part of efforts to support the countries’ initiatives, the ICLEI members will deliver the Seoul Declaration and their specific plans for COP 21. The host city will introduce its eco-friendly transportation system, urban regeneration project and the “One Less Nuclear Power Plant” project ― an energy-saving project that aims to reduce energy consumption as much as the capacity of one nuclear power plant by developing renewable energy. Right after “Seoul on Stage,” Seoul Mayor Park Won-soon will announce the “Promise of Seoul” ― a comprehensive strategy against climate change in 36 categories ― to clarify the city’s practical role and responsibility for deterring climate change. The comprehensive plan was outlined based on suggestions from the Korean public, which were reviewed by experts, the city said. The major goal of the strategy is to reduce the city’s carbon emissions by 10 million tons or 25 percent from the 2005 level by 2020, and further cut emissions by 20 million tons until 2030, it added. The comprehensive plan has beenwell received by the public, officials said. A number of civic groups launched a campaign called “Reducing 1 Ton of Greenhouse Gas per Person” last year to urge the public to work on reducing emissions in their daily lives. More than 800,000 citizens have signed up to take part in the anti-carbon move, they added. On the sidelines of the Congress, Seoul City will also ink memorandums of understanding with 10 foreign cities to boost policy sharing, especially in the issues of waste management, sewage treatment and air quality management. As part of efforts to support the local green industry, the city will hold a special meeting to bridge local environmentally friendly companies with overseas counterparts, the city said. A number of events and a climate change exhibition will also be open at DDP and Seoul Plaza for civic groups and citizens, it added.